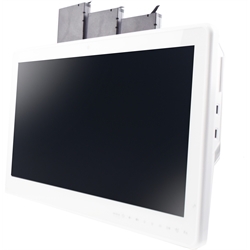 • This product is the only touch screen computer developed for the medical field operating features; it is the only product in the industry equipped with antibacterial functions. personnel to perform remote system management. 1. Highest level of medical safety protection EMC 4.0/ Safety 3.1 certification ready. 2. Integrated 3 hot-swappable batteries, 24/7 run-time. 3. Intel Kabylake 7th generation Core i7/i5/i3 processor. 4. i-Control design for thermal, power and CPU intelligent management. 5. Support Intel vPro technology by CPU, intelligent remote monitor / control / device SW management.